Only problem with Plok was that it lacked a save feature. Definitely better on emulator. 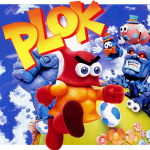 In all honesty, Plok is a pretty mediocre platformer. Its main saving grace though is that its soundtrack (courtesy of Tim Follin) is indisputably godly. Happy to see more Plok sheets!